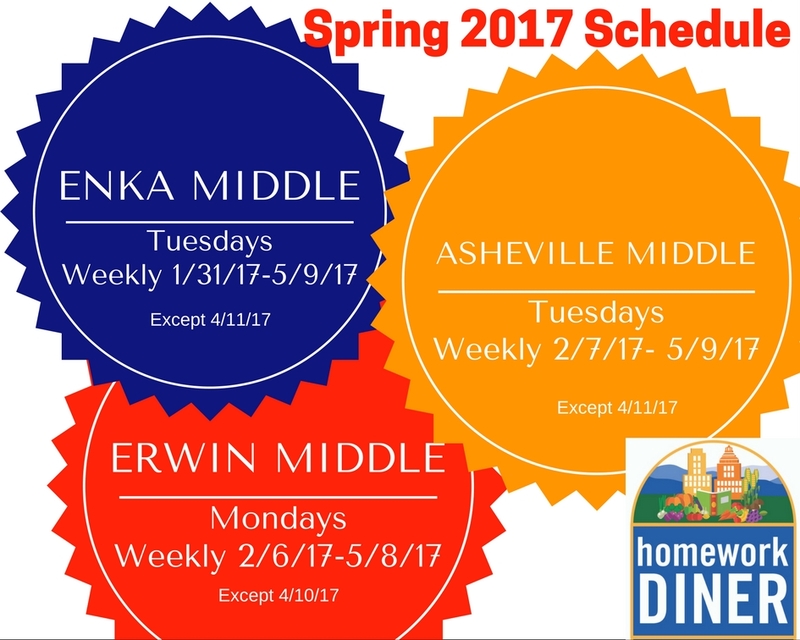 Tonight is the first Homework Diner of Spring 2017 at Enka Middle School! Homework Diners are weekly family engagement events that allow students and families to receive homework support from paid teachers and volunteer tutors and a free meal for the whole family. They currently take place at three area middle schools, Asheville, Enka, and Erwin. Homework Diners are open to any family in the surrounding school district, whether they have a child attending the middle school or not. Attendees will also have a chance to learn about community resources and take advantage of a variety of educational programs at these events. “This is the first time I have felt real hope for my child at school. I was able to meet with his teachers and it wasn’t some huge deal. We just spoke and I feel like I was actually heard. THIS diner is a good thing.”- an Enka Middle School parent who attended the first Homework Diner. Set-up/Registration/Welcome (4:30-6:15pm) – these volunteers will help with setup, registration and checking families in. Food Support (5:15-7:15pm)– these volunteers will help to serve the meals to the families. This will include serving and clean up afterwards. Tutoring Support (5:15p-7p) – these volunteers will float around and work with students and their families to help them understand and complete their homework. Ideally we are looking for tutors who are willing to commit to coming weekly for a minimum of 4 months. Or you can sign up for all currently posted Homework Diner events by clicking here. Volunteering is a great chance for team-building with a group and Homework Diners are a perfect fit. One way to approach it is to “adopt” a night. This would mean the group would take on the responsibility of recruiting the volunteers needed for a particular night. This is about 10 people. If the group wants to do that on a regular basis, a schedule could be set up to reserve the spots, ie. Your group is volunteering the 1st Tuesday of every month. If you have a group and are interested in volunteering with Homework Diners on an ongoing basis, please contact Sarah Roth, Volunteer Program Manager, sarah.roth@unitedwayabc.org, 828-239-1032 for more details on how to get involved.